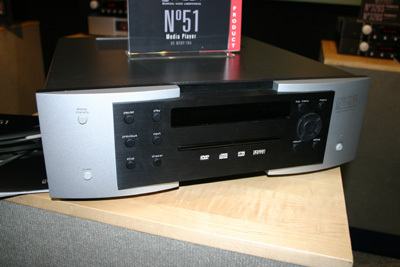 Mark Levinson (yep the same folks that provide the audio system in your Lexus) showed off the No51 Media Player at CEDIA. The company considers this product a milestone, as it is the first ever Mark Levinson-branded DVD/CD player. It doesn't play DVD-Audio or SACDs, which means this is similar to the DVD players that first entered the market all those years ago, except, you know, better. Why? Because the player has every output you can imagine (6 channel analog, XLR analog, AES/EBU digital, component, HDMI, etc.) and it looks glossy and fancy. The remote control is even cast-aluminum. Pricing is "TBD" which is codeword for "If you have to ask, you probably can't afford it." Picture of the back after the jump.